Before having seen Kilchoman listed in the single malt list I had not heard much about this distillery till after having tasted it. An Islay whisky, the Kilchoman (pronounced Kilhoman) distillery is a fairly young distillery. It was first established back in 2005 and it was the first distillery to have opened its door on Islay in 124 years. In my opinion, Islay is a region that produces wonderful whiskies. When I started drinking whisky it was the smoky whiskies that first got my attention. If you like smoky whiskies, then Islay whiskies are the ones you go looking for first. One of the things that make the Kilchoman distillery different, is that they not only grow their own barley, but are also one in a few distilleries that uses the traditional floor malting method. Here is a basic explanation of floor malting. First thing, before barley can be placed on the floor it is soaked in water. This actually makes the barley grow in bulk. It is then placed on the floor to dry and prevent it from growing any further. Once on the floor, it is turned (raked) often enough to ensure that its growth is even. 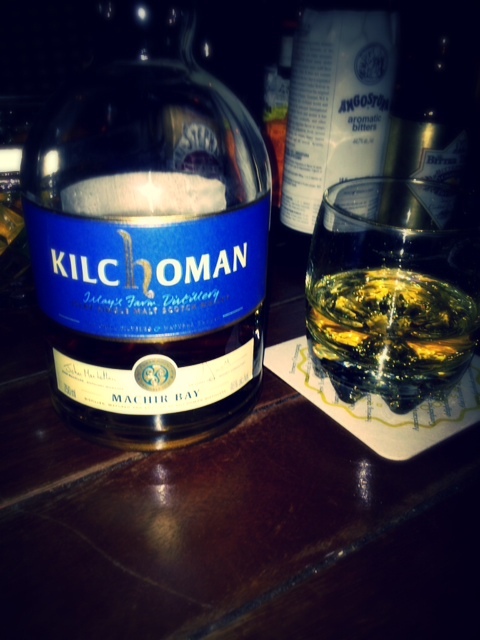 Machir Bay is matured in bourbon and sherry casks. If you were looking to buy I saw the prices ranging from $55-$69 depending on where you go to buy. Although they are a young distillery they already have about 5 products in their range, Machir Bay, 100% Islay, Loch Gorm, Vintages and Single Cask. I am sure their range will only continue to improve as the years go by. Now as for the taste, it’s quite enjoyable! Finish: Delightful burn! I find this whisky to be silky and creamy. This is another whisky that although young, it’s still quite impressive. I very much enjoyed the taste and how creamy/smooth it was. It is a whisky I would very much recommend tasting. I am certainly looking forward to seeing what else they come out with as the years go by. This made the best whisky sour I have ever tasted. It was beautiful on its own too. Really? Thanks for letting me know. I love a good whisky sour. Will have to try it out.